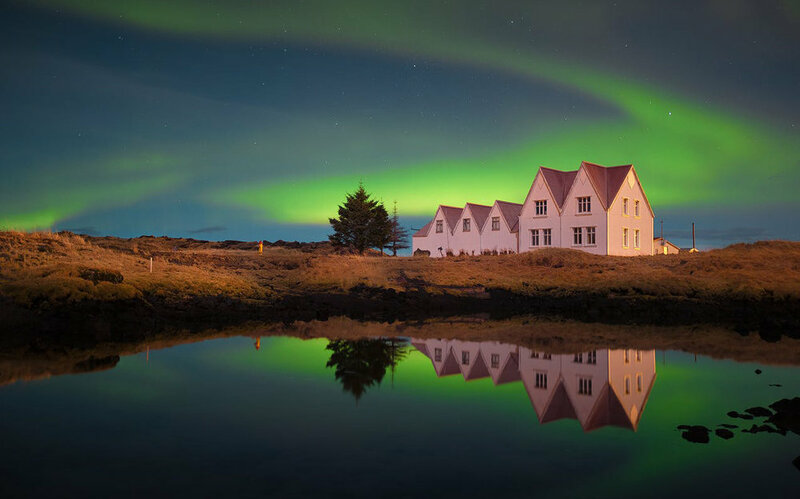 Set in the heart of a stunning lava landscape, Silica Hotel is just ten minutes’ walk from Blue Lagoon. The hotel offers its own private bathing lagoon, available for hotel guests every day from 09:00 - 22:00. Silica Hotel has won several design awards. Built in harmony with the surrounding landscape, it offers an oasis of calm, relaxation and healing. The hotel has 35 bright and spacious double/twin rooms. All rooms offer private facilities and a veranda, with breathtaking views of the surrounding lava fields. All rooms are equipped with private bathrooms and a shower. Take in a relaxing day at the famous Blue Lagoon, a geothermal spa in southwestern Iceland. The spa is located in a lava field near Grindavík on the Reykjanes Peninsula, in a location favourable for geothermal power. The lagoon is a man-made lagoon which is fed by the water output of the nearby geothermal power plant Svartsengi and is renewed every two days. It is the largest in the world. Superheated water is vented from the ground near a lava flow and used to run turbines that generate electricity. After going through the turbines, the steam and hot water passes through a heat exchanger to provide heat for a municipal water heating system. Then the water is fed into the lagoon for recreational and medicinal users to bathe in. Head to the peak via mountain truck up to the roots of Snæfellsjökull glacier at 750-meter elevation. Then walk up to the glacier ice where you’ll put on crampons and walk at relatively easy pace up to about 900 meters to see crevasses, moulins and other interesting ice formations on the way. You’ll stop regularly on the way to enjoy the beautiful view over the lowlands and Breiðafjörður bay on one side and up to Snæfellsjökull's summit on the other side. Tour the renowned Golden Circle, including a visit to the famous Geysir hot spring area, where Strokkur erupts every 5-10 minutes. Later, a stay in Husafell is an excellent place to observe the Northern Lights, should they appear. The location is far away from city lights, making it possible to observe this natural phenomenon. The first restaurant in Iceland to have been awarded a coveted Michelin star, Dill is celebrated for its exceptional New Nordic menu. Chef Gunnar Karl Gislason is the creative force behind the culinary offering here, in which dishes fuse traditional Nordic ingredients with modern culinary techniques and plenty of experimentation. A seven-course tasting menu is curated weekly, with wine pairing by sommelier Ólafur Örn Ólafsson; expect flavor combinations such as pork belly with parsnip and honey, and pear with almond and birch.